During a renovation, a homeowner has two visions to contend with: the original architect of the home and the new firm that's ready to shake things up. Balancing those voices can be tricky, especially when that original creator is related to the homeowner. 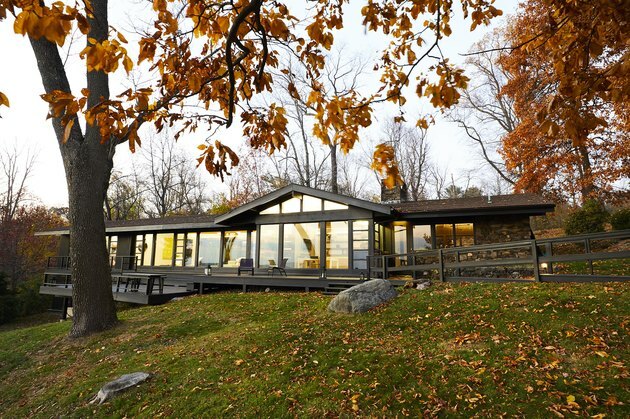 When architects Tal Schori and Rus Mehta, founders of GRT Architects, came on board to renovate a Hudson Valley home, they quickly learned that one of the clients, a New York City couple working in journalism and the arts, had a strong family connection to the property. The home was designed by the client's grandmother, Roberta Thrun, one of the first women to study architecture at Columbia University. (Intimidating, much?) So, Schori and Mehta worked with the couple to bring in their style, while keeping the home's original personality intact. Because of the budget, the renovation was done on a room-by-room basis — with an eye towards how everything would fit together — and in the end they were able to complete the entire main level. 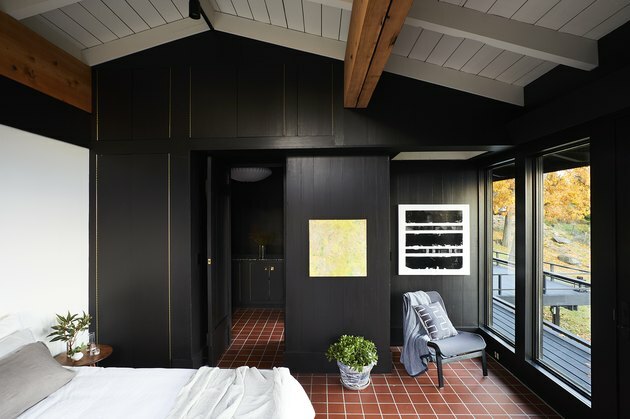 Dark brown paneling was painted black, modernizing the spaces and letting the incredible views take center stage. 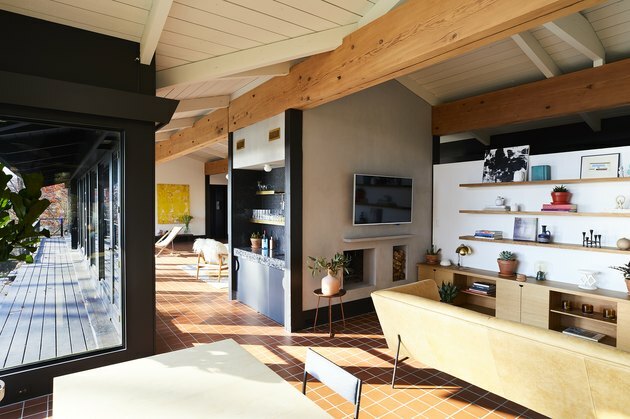 The result preserves the home's rich architectural — and family — history, while feeling fresh and modern for a new generation. 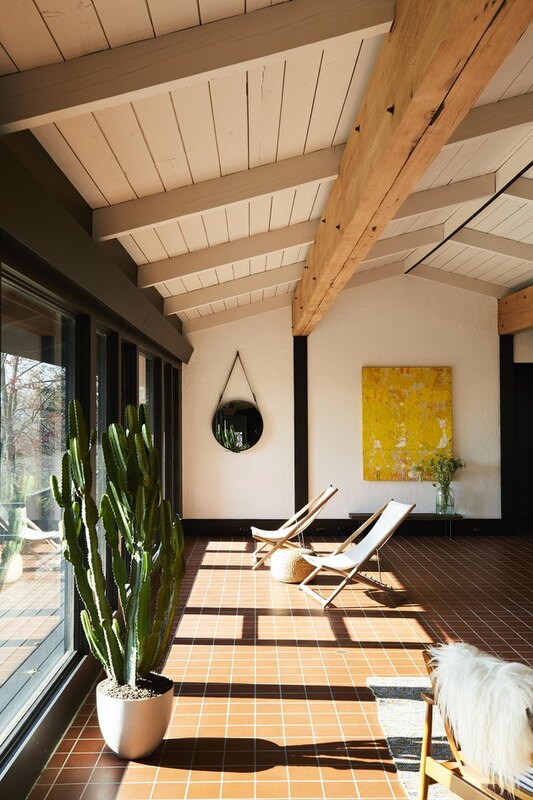 Two backbones of the design were the original Douglas fir beams, which run the entire length of the house, and the square terracotta tiles that cover the entire floor. The clients selected the furnishings, bringing in streamlined and midcentury-style pieces. 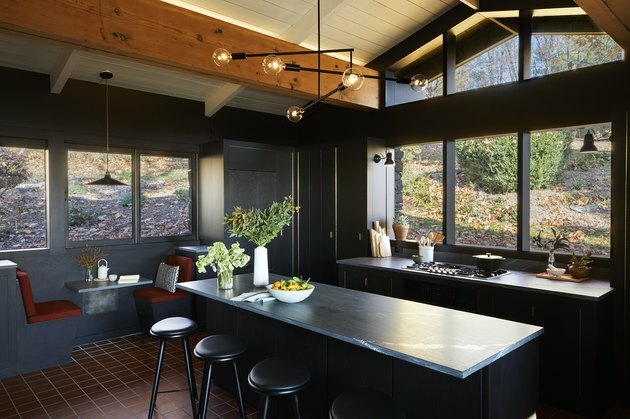 The architects tested every shade just short of black for the woodwork, but ended up going with a low-gloss true black. "The dark colors work to create a void in the foreground and highlight the distant vistas," said Mehta and Schori. Custom cabinetry by Max Wang Studio was installed in the sitting area. The team applied Mortex to the fireplace, giving it a cement finish. Built-in cabinetry near the sitting area was revived with black paint and new brass hardware. The kitchen's original cabinets were carefully demolished and the wood was repurposed to construct the kitchen island and banquette. 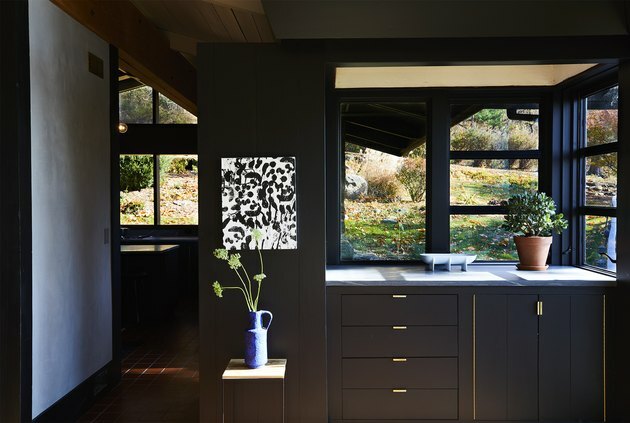 The architects chose Pietra Cardosa schist countertops to complement the dark cabinets. 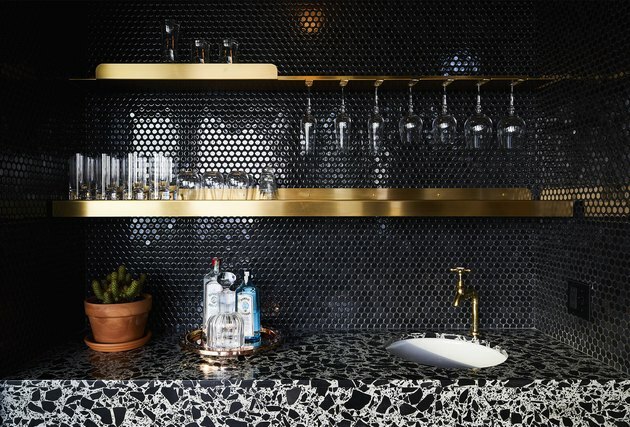 Waterworks penny tile lines the sleek bar, which features custom-cast terrazzo counters and brass shelves by Max Wang Studio and Milgo Bufkin. The black-and-white master bedroom feels right in step with the rest of the home's design. Abstract paintings and a patterned pillow break up the dark walls and solid furnishings. 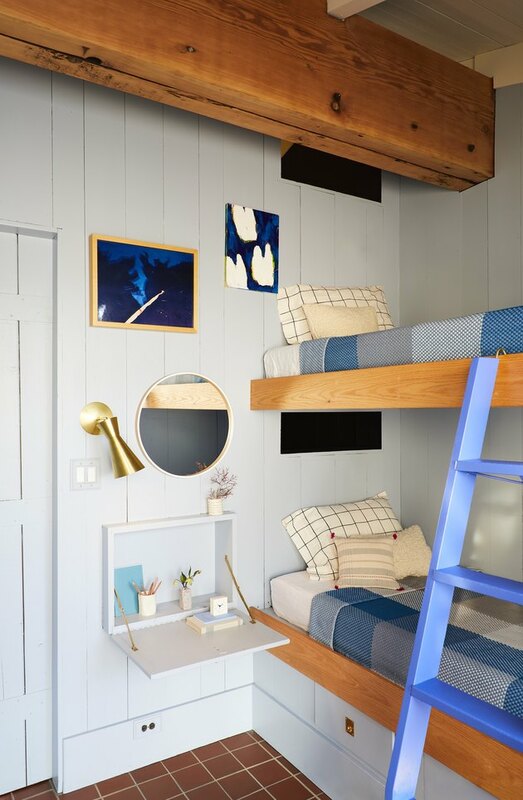 The architects chose a completely different color palette for the whimsical bunk room, incorporating bright blues and light grays. The clever folding desk doubles as a nightstand for the lower bunk. 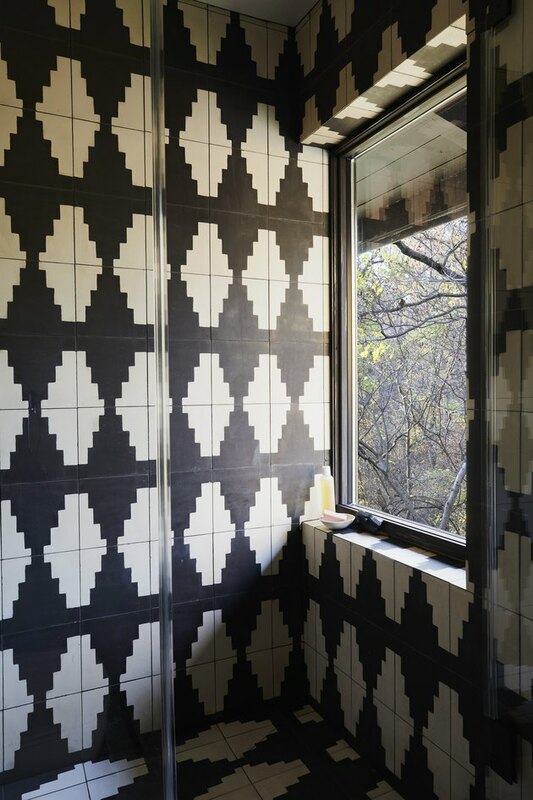 Zuni Zebra tiles from Exquisite Surfaces line the bathroom. 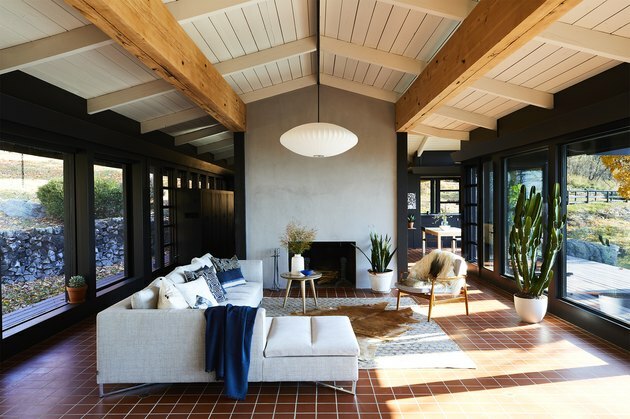 "We looked carefully for a tile that had a handmade irregularity and timeless patterning that blurs the line between what's new and old," said the architects.